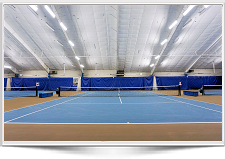 U ntil recently racquetball lighting has been limited to multi purpose commercial Metal Halide or Fluorescent office fixtures that are very inefficient, and difficult to maintain. Brite Courts racquetball lighting fixtures are engineered specifically for racquetball courts. They produce a very high quality of light while their design provides a near seamless transition between the ceiling and the fixture to minimize unexpected ball deflection. 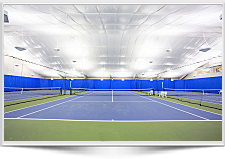 We offer several types of lighting solutions for Racquetball courts, your existing lighting is likely 250-watt or 400 watt metal halides in a standard 2’x2′ fixture or outdated T12 fluorescsent. The metal halides fixtures are extremely inefficient in terms of energy use, light quality, and light output. 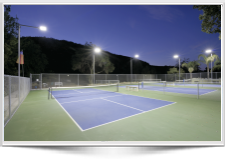 Brite Court offers Three lighting solutions; we can provide LED which offers a long life of 50,000 hours or our Induction racquetball lighting rated at 100,000 hours. Another option is Fluorescent however fluorescent is limited to 20,000 hours lamp life. Clearly considering that access to maintain the fixture is difficult the induction or LED Racquetball lighting solutions are best.